Overall: The Amana ABB1921WEW is an affordable, functional refrigerator that is perfect if space and budget are a concern. One of the standout features of this Amana refrigerator is its huge 18.5 cubic foot interior. In all of our research we've learned that space is only great when it's usable and that's what sets this refrigerator apart. The shelving, freezer and, specifically, the interior door space were extremely well designed. Allowing not only for gallon door storage, but also storage for oddly shaped items (like wine bottles). Great Storage: As we mentioned above, one of the standout features of this bottom freezer refrigerator is the layout of the interior storage. While this picture doesn't show it, the freezer storage of the Amana ABB1921WEW comes with a pull out wire basket, shelving and interior door storage. All of these allow you to keep your favorite items as accessible as possible. Kudos to to the designers on this fridge for such an innovative interior layout at such a low price. 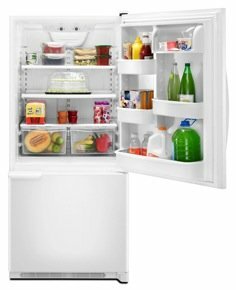 EasyReach Freezer Door: Typically bottom freezers come with a sliding freezer drawer but this model actually has a single, swinging door instead. This makes accessing your frozen foods easy and convenient. No more straining! *Note: You will have to open the door and then pull out the drawer. Many lower freezers now have the door and drawer all in one making it easier to open and close. This may not seem like a big deal but when you have your hands full of frozen food it is just easier to push it closed with your hip. It's not essential, but we just wanted to be honest. Reversible Door Opening: This is one of those features that you never realize you need until you need it. But changing the door opening from one side to the other becomes crucial when space is limited or when you move. To those of you living in the tiny kitchens of Tokyo, Manhattan, or Paris this feature is essential! Easy Glide Freezer Basket: One thing that's great about a wire basket (that's often overlooked) is the fact that you can see through it! A simple glance will help you find what you need when you need it -- especially things placed at the very bottom. This is something that pull out drawer/doors don't have to offer. *We can tell you from experience, knowing what is on the bottom of your bottom freezer drawer (not the basket kind) is not an easy, or painless task. Colors: This Amana refrigerator only comes in a white finish. MSRP: Originally this fridge was priced at $1049 and was selling brand new for only $949 until it was discontinued. If this is a model you truly desire, then you will probably end up finding it used online or in an appliance resale store. While there are a number of bottom freezer refrigerator models in a wide variety of price ranges, you should be aware that many companies are phasing out the bottom freezer model from their lines. Our guess is that most people really prefer the double doors of a french door. If you prefer the single door, then here are a few other models you might also want to consider. We have more than a few other Amana models for you to look at if the Click here to see them or take a look at a list of our favorites across all brands.